As the crowds got thicker and the stages got harder to get anywhere close to, my first day of Lollapalooza 2011 continued into the evening with sets from The Mountain Goats, Bright Eyes, OK GO and headliners Coldplay. 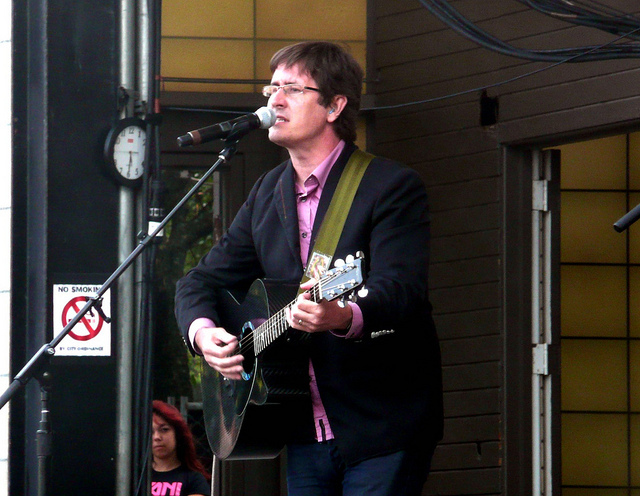 The Mountain Goats are a great band. Let me just say that first, because they are. They play with as much energy as you could ask for from a band, give it their all and are obviously 100% into what they're doing. Plus, the material is top-notch. So Mountain Goats fans, please forgive me when I say this: I can't stand John Darnielle's voice. I dig many unique voices in music, but Mr. Darnielle's nasally, high delivery just grates on me. I can't help it. So any enthusiasm I convey while writing about this performance is unfortunately marred by that unchangeable fact. But really, they played wonderfully, and John gave a couple nods to Chicago, which was appreciated (he said he decided to play a few songs solo acoustically during the middle of the set just so he could get to "Cubs in Five" and later paid tribute to Windy City classic rockers Styx with a left-field cover of "Babe"). To close the set, the band had Jenn Wasner from fellow Lolla performing band Wye Oak join them on stage for a spirited version of "This Year." It was definitely one of the strongest performances of the day, grating vocals or not. Next (after a pretty painful experience spending a ridiculous amount of time in line at the Lou Malnati's stand), I caught the final half of Bright Eyes from afar. I have never considered myself a big fan of the band, but I have to say they sounded really good. As with The Mountain Goats, there was obviously an incredible amount of energy and passion put into the performance, made even more effective by a superb sound mix--everything was crystal clear. From what I saw, I doubt if any Bright Eyes fan went away disappointed. I had a similar experience watching the second half of OK GO's set back at the Google+ stage. Going in as a casual fan of the band at best, they managed to make me a much bigger fan with their energetic performance, which culminated in a great big crowd singalong of closing song "This Too Shall Pass." 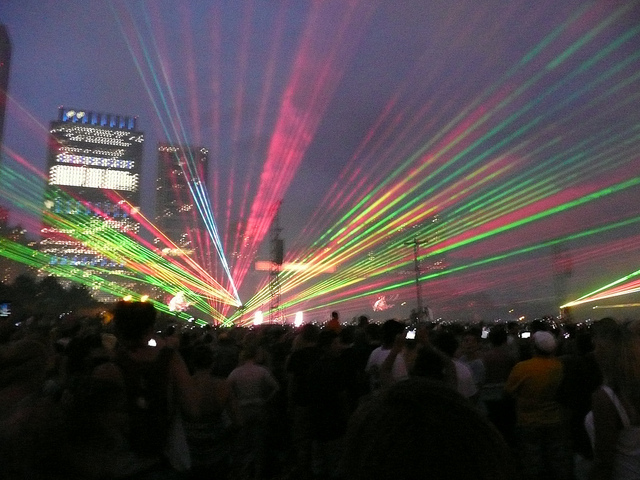 I generally like to go to Lollapalooza for the bands in the first half of each day and begin to lose a bit of interest as the days go on, so even though I opted for Coldplay over other headliners Muse and Girl Talk, I wasn't incredibly thrilled to see them. I can appreciate their talent, but they've always been a bit too sleepy-sounding for me. The fact that I knew I'd be familiar with more songs from them than the others persuaded my decision. After the hilariously unlikely intro music of Jay Z's "99 Problems" played, the band delivered a fine set, just like you'd expect them to (enhanced by some shiny effects, like a laser show). I'm probably not going to run out and buy any Coldplay albums anytime soon, but I can't say they didn't show plenty of proof why they're so successful. Now to gear up for day two. Keep an eye out right here for recaps of Saturday performances coming up next! You should have checked out Muse. Definitely not "sleepy sounding." ;) And... they had lasers, too.